Today is the birthday of the great Broadway showman John Murray Anderson (1886-1954). Anderson was a kind of Renaissance man of theatre and film: dancer, director, producer, designer writer, and someone to be included with Florenz Ziegfeld, George White, and Earl Carroll on the short list of the great impresarios of Broadway revues. The son of a wealthy Canadian businessman and politician, Anderson was educated in Europe. His social connections opened doors for him, and he was able to apprentice for two years with Sir Herbert Beerbohm Tree, and also studied with Max Reinhardt. Much like Vernon and Irene Castle (and unlike most everyone else in those days) he entered show business through the unusual route of high society. Like the Castles he operated a dance academy for a time (he is featured in the 1914 book Social Dancing of Today). He began directing society and public pageants and masques (one in Denver had a cast of 3,000). He ran an art theatre on 36th Street called the Little Silver Theatre. He ran a summer stock theatre called the Cabaret Barn in Bar Harbor, Maine for two seasons. In the late teens he produced and hosted cabarets at the Palais Royal Restaurant in New York. All of this was so much prologue to his Broadway career, where he started out at the top and pretty much stayed there. He wrote, directed and produced his annual series of revues The Greenwich Village Follies from 1919 to 1924. 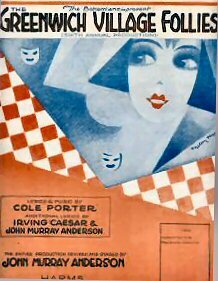 This led to the opportunity to direct Irving Berlin’s Music Box Revue in 1924, starring Fanny Brice, Clark & MCCullough, the Brox Sisters, et al. In 1929, there was Murray Anderson’s Almanac. In 1930, he went out to Hollywood to direct the Paul Whiteman revue film King of Jazz. He directed presentations at Radio City Music Hall in 1933, then he staged several Ziegfeld Follies (1934, 1936, 1943) and wrote the screenplay to the 1946 Hollywood film version of the show. Other legendary Broadway shows he staged were Life Begins at 8:40 (1934), Billy Rose’s Jumbo (1935), the show at Billy Rose’s Diamond Horseshoe 1938-50, Ringling Brothers Barnum & Bailey Circus 1942-1951 (including the circus sequences used in Cecil B. DeMille’s 1952 film The Greatest Show on Earth), Olsen and Johnson’s Laffing Room Only (1944) and directed the water ballet in Esther Williams’ 1944 movie Bathing Beauty. And I have left out dozens and dozens of credits! His last Broadway show was a revived version of John Murray Anderson’s Almanac (1953).